Welcome to Alice's Secret Travellers Inn; a cozy, quiet, and relaxed hostel nestled in the middle of Australia's Red center. Being the smallest, we pride ourselves on our cleanliness and friendliness, and we are happy to give you that extra bit of attention you will miss in the bigger places. Alice’s Secret Travellers Inn is a quiet green little oasis not far off the centre of Alice Springs. We offer air-conditioned accommodation in funky themed private and dormitory rooms. All include bed linen and access to shared bathroom facilities. 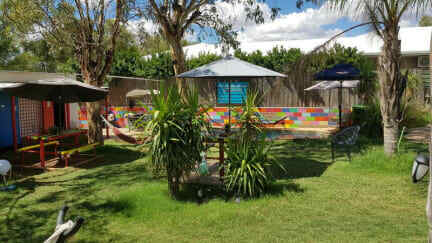 This hostel is the perfect spot to get ready for your outback adventure (ask for specials) or to relax and recover after it. The garden being the lovingly decorated colorful heart is featured by an outdoor swimming pool, hammocks, sunbeds and hollywood swings. The fully equipped kitchen and free BBQ facilities give you the opportunity to cook and sit with fellow guests exchanging stories of your travel adventures. The shared TV lounge and the book city are two comfy hideaways to chill, even on a rainy day. Alice’s Secret Travellers Inn is located less than a 10 minutes’ walk from the Alice Springs Botanical Gardens, Alice Plaza and the Aboriginal Australia Art & Culture Centre are both a 15-minute walk away. Our accredited Travel Agency can advise and ensure bookings with all major companies. Booking with us will save you time and money! For sure! Such a beautiful space, and the little touches here and there are what makes it so brilliant! The fairy garden is such a safe spot, and Seb and Miriam were so great with everything! They helped me organise my trips, were so accommodative and genuinely just trying to make everybody’s stay as enjoyable as possible. 100% would recommend and I will definitely return. I love love love it here. Immediately felt at home and the staff feel like family. This is a lovely peaceful spot to rest up after any of the long journeys it takes to get here. The pool is perfect, everyone is friendly, a 10 min walk to the town. 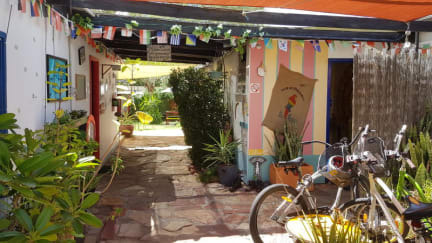 A few things others might pick up on is the front gate that is left open during office hours and the small walk into town but the rest of the stay in this quirky little bolt hole makes up for this 100 times. Stay here! Really good little hostel for a small budget. Great layout and location is close to the city center. Staff were super nice. Nice and big rooms. A lovely garden with a pool. No lockers in the room. The kitchen is small but very clean. Overall a great hostel with a great staff. Funky place!! The hostel is so pretty and the garden is amazing. I didnt want to leave. Would definitely recommend to all.